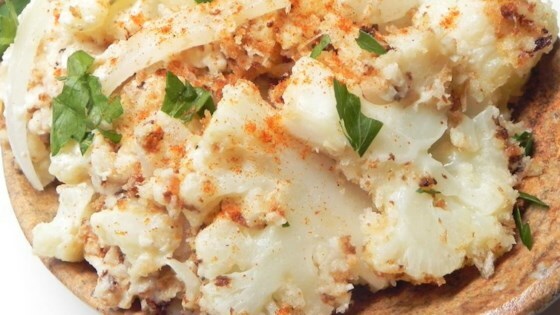 "I adapted this recipe from my mac and cheese dish when my husband went on a low-carb diet." Preheat oven to 375 degrees F (190 degrees C). Grease a Dutch oven or baking dish. Place a steamer insert into a saucepan and fill with water to just below the bottom of the steamer. Bring water to a boil. Add cauliflower, cover, and steam until slightly tender, 5 to 6 minutes. Remove cauliflower and cool until easily handled. Break cauliflower into bite-size pieces. Layer cauliflower, onion, mozzarella cheese, Monterey Jack cheese, and Gouda cheese in the Dutch oven; season with cayenne pepper, salt, and black pepper. Pour milk over cheese layer. Cover Dutch oven. Bake in the preheated oven for 45 minutes. Remove cover and stir mixture. Sprinkle bread crumbs over the top. Continue baking until top is browned, 20 to 30 minutes more. Cool for 5 minutes before serving. Fontina cheese can be used in place of the gouda cheese, if desired. By using grated cheese instead of creating a cheese sauce, you get thick strings of gooey cheese as you eat (sort of like pizza). Some of the cheese will become sauce with the milk. If you like more of a sauce, double the milk or cream and stir every 20 minutes. Cream can be used in place of the milk, if desired. Very disappointed with this recipe. It turned out watery and the cheese congealed. I will definitely make a cheese sauce next time.